Lahore (Press Release): 53% of the population of OIC (Organization for the Islamic Conference) countries lives in the rural area which is globally more than the other areas and its commitment to the total agricultural department is 34%. On the other hand, 49% population lives in the rural areas while their commitment to the total agricultural department is 38%. OIC Countries have 29% of the world’s total agricultural land while the Muslim population in the world is 23%. On the other side, the share of international GDP of OIC Countries in the agricultural department is only 11% approximately and considering these facts and figures, it’s found that Muslim countries as compared globally have more agricultural land, more portion of population in rural areas, even so agricultural department faces failure and destruction and approximately 55% rural population of the Muslim world is living below the poverty line. While it is proved from different researches that the main reason of urban poverty is also the rural poverty which migrate from villages to cities to get rid of poverty and for their better future and get more into the swamp of poverty. If we look carefully, there are many reasons of lack of agriculture and poverty in Muslim world. 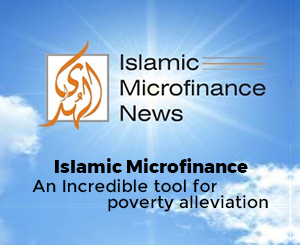 In the light of different surveys and researches on poverty conducted by more than 45 countries it is concluded that the main reason of the lack of agriculture and the increment of poverty is the non-availability of such Islamic Finance which are according to the religious values of Muslims. Muslims do not use the conventional banking & finance products to avoid the interest and get into the category of financial exclusion. Due to the non-availability of finance in agricultural sector, the agricultural production is affected too much which causes the negative trends in the process of agriculture production and is also a cause of poverty in rural areas. This poverty migrates from villages to cities, while other reasons of agricultural disappointment and poverty in Muslim countries are; contemporary system of agriculture production, country situations, weather and environmental changings, political and economic stability, migration of agricultural persons to cities, irrigation systems etc. If we think to promote the agriculture sector, then the main point which should be considered is the availability of Islamic financial products, so that financial inclusion in the Muslim world could be promoted and these products could reach the farmers which are according to the religious values. 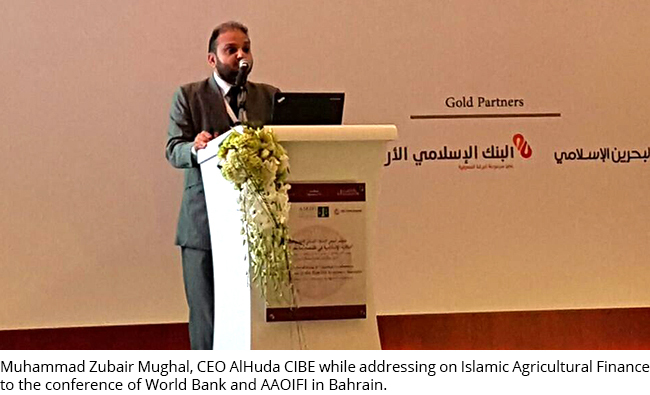 Muhammad Zubair Mughal, Chief Executive Officer of AlHuda CIBE while addressing on Islamic Agriculture expressed these thoughts in an international Islamic Banking & Finance conference organized by World Bank and AAOIFI in Bahrain. The individuals of 45 countries participated in this conference. He further added that the best products of Islamic Agriculture and Microfinance for agricultural promotion and poverty alleviation are present which can be properly and easily utilized to alleviate the poverty and promote agriculture. He said that many best practices on Islamic agricultural finance have been conducted in many countries including Yemen, Afghanistan, Sudan, Albania and Pakistan which can be presented as a role model to bring the green revolution.